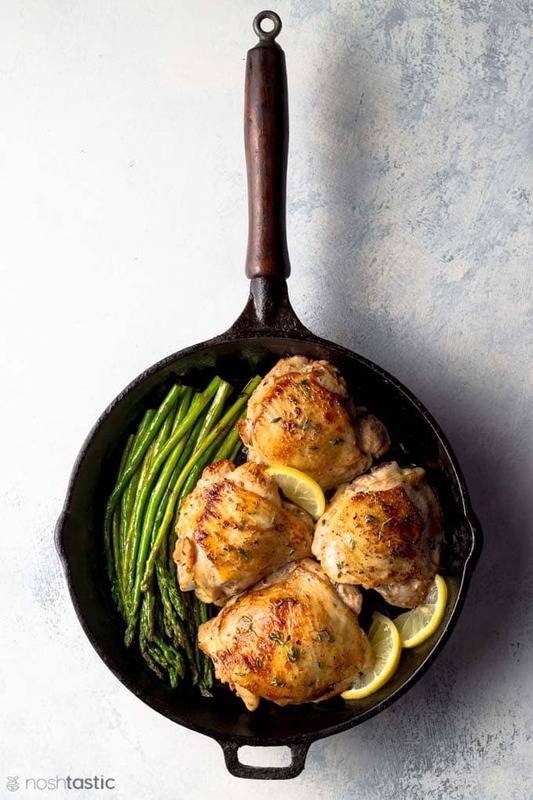 With a short marinate time and only 2g net carbs per serving, this is a perfect low carb and keto, paleo and Whole30 chicken dinner recipe you can easily make tonight! 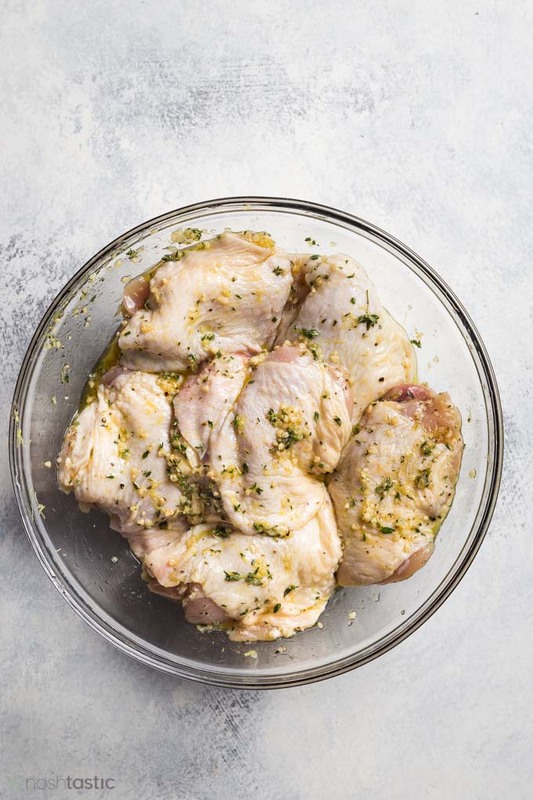 So the first thing you need to do is assemble the marinade ingredients, they are thyme leaves, garlic, salt, pepper, lemon juice and zest, and a little olive oil. Using either a bag or a bowl large enough to accommodate six chicken thighs (bone in, skin on) you can simply pour over the marinade and massage it well into the chicken for maximum flavor, then marinate it for thirty minutes. If you only plan to marinate for thirty minutes you can simply leave it out of the fridge, any longer and it’s safest to chill it while you wait. 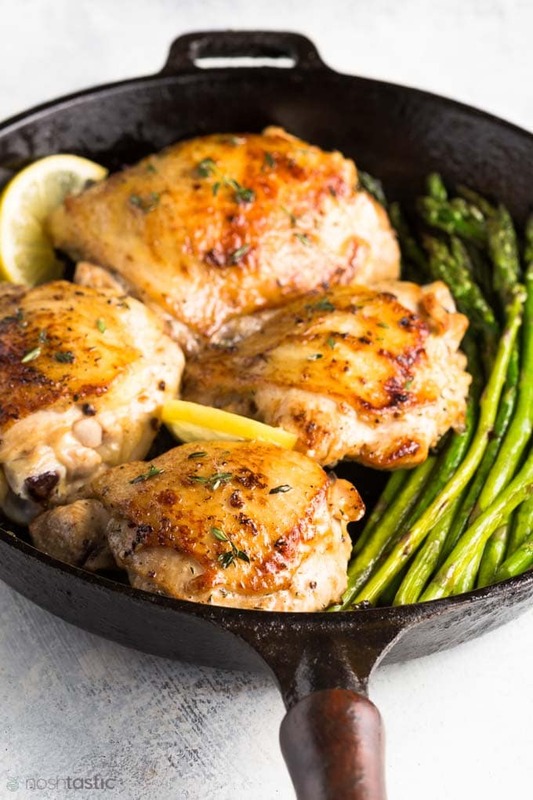 Three ways to cook your lemon thyme chicken thighs! I made them in a skillet on the stove top, simply add the chicken thighs skin side down into a hot cast iron skillet over a medium heat with about one tablespoon of olive oil and cook for about six to eight minutes, then turn them over and continue cooking for a further six to eight minutes or until the thighs are fully cooked, remove and set aside. To cook your lemon thyme chicken on a gas grill preheat it to medium on one side of the grill only. Then, add the chicken thighs with the skin side down onto well oiled grates directly over the flames for about 5-6 minutes with the lid on. If you get a flare up move them to the unlit side. After five or six minutes turn the chicken over and move it onto the other side of the grill (this is indirect cooking) and continue cooking with the lid on for up to 20 minutes or until they reach 165°F using an instant read thermometer, this will take about 20 minutes, longer if you repeatedly open the lid! For a charcoal grill use the same method outlined above but have the hot coals stacked only on one side of the grill. Preheat your oven to 375F. Place the marinated chicken thighs onto a parchment lined sheet pan and bake in the already hot oven for up to 45 minutes, or until they are fully cooked. 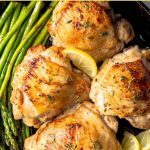 Delicious, easy and with only a thirty minute marinate time, you'll love these Lemon Thyme Chicken Thighs. Combine the thyme, garlic, salt, pepper, lemon juice, lemon zest, and olive oil and marinate the chicken thighs for at least 30 minutes. Place the chicken thighs skin side down into a hot cast iron skillet over a medium heat with 1 tbsp olive oil and cook for about six to eight minutes then turn over and continue cooking for a further six to eight minutes or until the thighs are fully cooked to 165°F, then remove and set aside. add 1 tbsp butter and 1 tbsp olive oil to the same skillet and melt butter over a medium heat. Saute the asparagus spears in the butter, and 1 tbsp water, for a few minutes until tender, serve hot. Preheat a gas grill to medium heat on one side of your grill only. Place the chicken thighs skin side down onto well oiled grates directly over the flames for about 5-6 minutes with the lid on. If you get a flare up move them to the unlit side. After five or six minutes turn the chicken over and move to the cooler side of the grill without flames (this is indirect cooking) and continue cooking with the lid on for up to 20 minutes or until they reach 165°F using an instant read thermometer, this will take about 20 minutes, longer if you repeatedly open the lid! I made this for last night’s dinner it was delicious!